Winnipeg, MB: Art Bookbindery, 2006. You two used to get along – when you were younger. Andrew shook his head. That was a long time ago! It's just that he keeps getting weirder and weirder. Andrew glanced up at Grandpa Tom, saw the look of confusion on his face and tried to explain. It's the way that he walks. And the way that he talks. And the way that he dresses. Have you seen the clothes he wears? I wouldn't be caught dead in those clothes! Just saw him a few minutes ago. Looked fine to me. Grandpa Tom's voice was all deep and gravelly again. Andrew could definitely feel a lecture coming on? What he didn't expect to hear was what came next. So, it's just plain prejudice. Had Andrew outgrown his long time friend; had Michael really changed that much, or was it prejudice? Andrew didn't believe it was that. After all, Michael, a young African American boy, was a city kid from the south and didn't even belong on the reserve. Yet, he'd been there many times before, visiting his grandparents, and they had always been friends. What had changed? Michael's attitude had changed for sure. He didn't seem to like it on the Rabbit Lake Reserve anymore. He swaggered when he walked, found fault with all of the Christmas festivities, and, worst of all, he made it clear that he belonged at Grandpa Tom's more than Andrew did. Grandpa Tom was Michael's real grandfather, yet Andrew felt he had just as much right at Grandpa Tom's because he lived nearby and Grandpa Tom treated him like family. What made it all worse was that he, Andrew, was the only one that seemed to feel angry with Michael. Finally, Andrew had had enough of Michael's constant fault finding and his need for attention. He threw his snowmobile keys at Michael and told him to get lost. Andrew's would come to regret this serious lapse in judgement that would ultimately put three lives in danger. 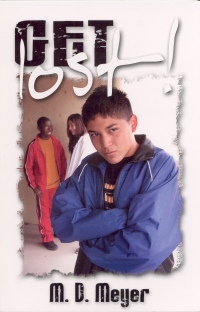 Meyer has written a novel for young people that contains a very important message. Prejudice is everywhere. No one is immune, but, if it is ever to stop, young people must be the ones to put it to an end. Get Lost! is an interesting, easy to read novel about the consequences of hate and lack of tolerance. Elaine Fuhr, a retired school teacher, lives in Alberta.